This pocket guide is a single-volume source of the most common and important formulas and laboratory values used in the daily practice of acute care and critical care medicine. Information is presented in outline format and as tables, graphics, and algorithms to facilitate quick look up. 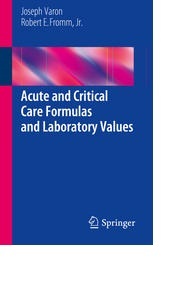 Acute and Critical Care Formulas and Laboratory Values is designed to help clinicians to interpret clinical data, to apply formulas, and to understand laboratory values, and to integrate this information with their knowledge of pathophysiology to promote the delivery of evidence-based care.